Source: Produced in E. coli. 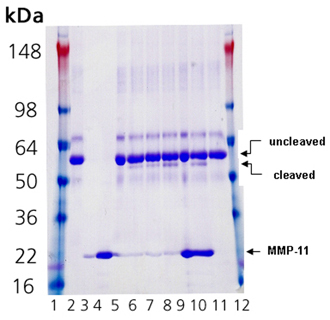 Active Matrix Metalloproteinase-11 (MMP-11, Stromelysin-3) catalytic domain from human cDNA. The enzyme consists of the catalytic domain of human MMP-11 (Phe98-Ser266, NM_005940) with a C-terminal purification tag. MMPs lacking this domain cannot cleave native collagens; however, activity toward other targets such as gelatin, casein, or peptide substrates is unaffected. It may be an important link between obesity and cancer. Specific Activity: Due to its unusual substrate preferences [A(A/Q)(N/A)~(L/Y)(T/V/M/R)(R/K), or G(G/A)E~LR5], MMP-11 cleaves MMP peptide substrates such as Prod. No. BML-P125, BML-P126, and BML-P132 extremely slowly (several hours yield very little product). Therefore, the activity of each lot of MMP-11 is verified by digestion of macromolecules. Application Notes: Useful to study enzyme kinetics, cleave target substrates, and screen for inhibitors. Scientific Background: MMP-11 may be a link between obesity and cancer. Coomassie-stained SDS-PAGE showing a timecourse of α1-antitrypsin (3ug) cleavage after incubation at 37°C with or without MMP-11 catalytic domain. Lanes are as follows: 1. Marker; 2. 1.5 μg α1-antitrypsin (0 hours); 3. 50 ng MMP-11, (0 hours); 4. 1 μg MMP-11, (0 hours); 5. 1.5 μg α1-antitrypsin incubated with 50 ng MMP-11 (0 hours); 6. 1.5 μg α1-antitrypsin incubated with 50 ng MMP-11 (3 hours); 7. 1.5 μg α1-antitrypsin incubated with 50 ng MMP-11 (8 hours); 8. 1.5 μg α1-antitrypsin incubated with 50 ng MMP-11 (24 hours); 9. 1.5 μg α1-antitrypsin incubated with 1 μg MMP-11 (0 hours); 10. 1.5 μg α1-antitrypsin incubated with 1 μg MMP-11 (24 hours); 11. 1.5 μg α1-antitrypsin (24 hours); 12. Marker.